Thanks for sharing your hack on knitted fabrics! I agree that it is quite scary to play around knitted fabrics, especially wool because it is quite expensive, too! But thanks a lot sharing your hack with us. It builds up the confidence that there is a way to sew wool fabrics without going into waste! I pull together a hack of about three patterns http://sewiststitch.blogspot.co.nz/search/label/Sewaholic but I should have done what you did – just keep taking it in at the side seams until the fit was better. I like the way you’ve pegged yours in on the skirt, it falls nicely. Looks great and perfect for the fall! Hello! 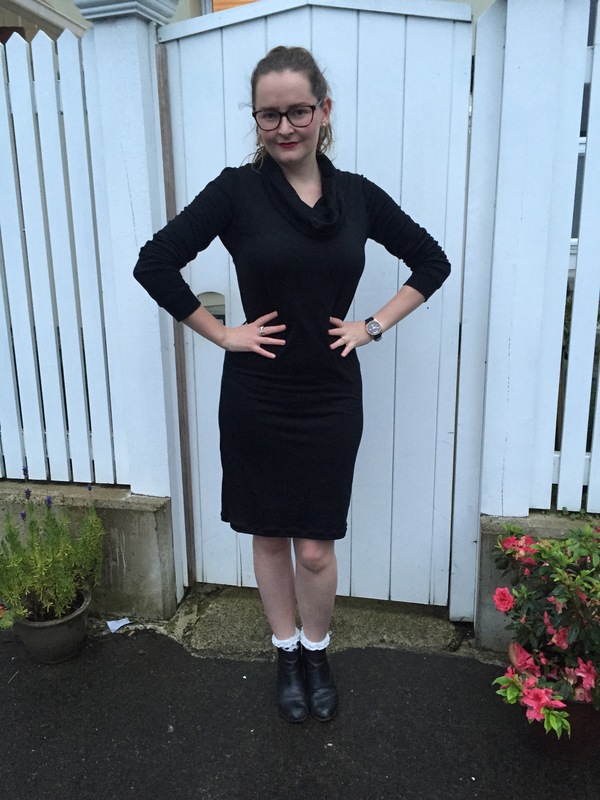 I did do a Renfrew pattern hack to show people how to make their own French Sewing Bee finale dress. It’s in 3 parts, sorry for the spam! I love knit fabrics for their comfort and ease in sewing up. I know some people don’t like sewing with knits, but I love it. It’s so easy to complete a project! Your dress is lovely. Great job with the hack! 💕💕 this hack & am glad you’re doing your own thing in your own time. Inspiration for me to start a similar hack I’d been thinking about. I have made a Renfrew hack! Actually a mash up of the Renfrew and the Nettie (a Nettiefrew?!) Here it is: http://funkbunnysgarden.blogspot.com.au/2015/07/sydney-jacket-2-and-renfrewnettie-mash.html. Your Renfrew dress looks great! Nice LBD! I haven’t made the Renfrew but I’ve made a similar jersey dress that is always either on my body or in the wash. Definitely the signs of a good workhorse garment. Also I quite enjoy short blog posts, they’re refreshing. Reminds me that I should pen a short one on my own neglected blog!